July 16, 2015 - PRLog -- "There are those who chant the eldritch songs, who gather in nameless places to celebrate the return of the great Old Ones. For millennia their tales have not been told. Within these haunted pages you will find their stories of yearning, terror, murder, and a faith that defies the understanding of humanity. Come and look into the minds of the Idolaters of Cthulhu." That's how the new anthology from Alban Lake Publishing is being described. With stories expanding the popular Cthulhu Mythos originated by H.P. Lovecraft, this anthology explores the darker side of an already dark subject. Find within its pages stories by award-winning authors Gregory L. Norris, Robin Wyatt Dunn, Robert Krog, and many others. 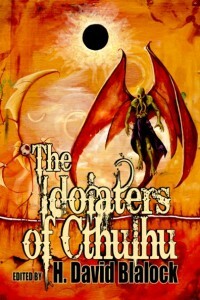 The Idolaters of Cthulhu is edited by H. David Blalock and Herika R. Raymer. The anthology is structured in three parts with a foreword by Blalock and atmospheric poetry from classical writers adding to the overall picture. The anthology opens with Beyond the Wall of Sleep by Lovecraft himself and closes with the powerful poem Afterwards by Clark Ashton Smith. 2013 Memphis Comic and Fantasy Convention this weekend! Find After Dinner Magic near you! Author Cynthia Leavelle has booksignings lined up - will you be there?